This is the third post in the series "Post Nano 29"er History" which aims to give the reader the sense of how 29'ers have become as popular as they are today. If you missed the first installment, please click here. Part II is here. If you are looking for more on 29"er history before 1999, please see my page on 29"er history here. 2007: By this time in the 29"er movement, it has become apparent that big wheeled mountain bikes are more than just a novelty. 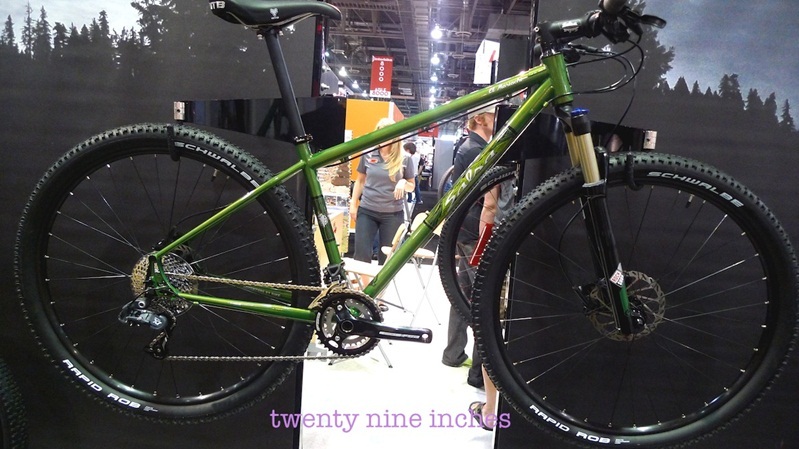 Several companies introduce new 29"er models during this year. This solidifies the category in mountain biking, yet- two big companies have yet to jump on board- Specialized and Giant- and the European market wants nothing to do with 29"ers at this point. So, while things seem to be going gangbusters in North America, 29"ers are not a "slam dunk" yet. Mid-level bicycle companies, seeing the 29"er growth, start to jump in with 29"er hard tails like the Haro Mary, seen here. These models were typically steel, single speed, (or multiple set up bikes with capabilities for gears or single speed), and often had a rigid fork. Haro was a bit unique in that they brought out a geared version of this bike later. That bike had a Rock Shox Reba on the front. While more choices were welcomed as far as hard tail bikes went, the almost universal use of the 38mm offset Rock Shox Reba and the overwhelming introduction of steel single speed, (or sold as single speed), bikes was getting to the point of over-saturation. Late in 2006 rumors were running about that said Fox Shocks were working on a "29"er specific" front fork. Well, those rumors turned out to be what has now become probably one of the bigger developments in 29"ers history since the Nanoraptor and the 2005 Rock Shox Reba. Once again, the common thread through all of this is the Gary Fisher Bikes company. "Soon we will all be able to tune our rides." What Gary was talking about then, only he and a handful of Trek and Gary Fisher engineers knew about. It was the fact that, first of all, Fox shocks would be entering the 29"er market. This was huge in and of itself at that time. However; what was being done in regards to geometry would have a long lasting effect on 29"ers that affects riders right up to the current times. Namely, that we can tune our rides. 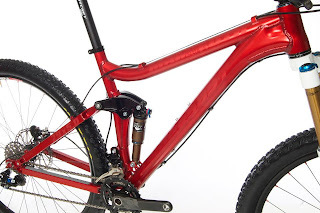 Gary Fisher Bikes, along with parent company, Trek Bicycles, paid for the development and the forgings and molds to produce the Fox shocks, and they also brought it out with an extra long offset. This was part of what they were dubbing as "G2 Geometry", a new thing for 29"ers, and an extension of Fisher's Genesis Geometry introduced in the late 90's for 26"ers. The offset for the 29"ers was decided upon after much rider testing, where different offsets were blindly tested and riders gave feedback on handling traits. Up to five different offsets were tried, and when the word came down as to what was universally decided was best, Trek/Fisher R&D rider and MTB Hall of Famer Travis Brown said he "couldn't believe it". It turned out to be a radical 51mm. Fox also did a G2 specific crown for the 26"ers, set at 46mm, and after Gary Fisher's year exclusive, this became the offset for the aftermarket 29"er forks. Some forks from Manitou also were set at this offset, and they became available at about the same time as the Fox Shocks. Manufacturers gravitated to the longer offset in subsequent years, and now this is the prevailing figure for fork offsets for 29"ers that are not "G2 Geometry". But that doesn't mean other forks use 46-47mm offsets. In a phenomenon that suggests the Fisher experimenting is being used yet today, some Fox and Manitou forks have a 43-44mm offset, and some 2012 Jamis models, for instance, still come with 38mm offset forks. Tune your ride indeed! Thanks for reading this two-part series. I will be adding this to the 29"er History Page for future reference. Back in 2007, (egads! Has it been that long ago? ), I wrote a post entitled "Drop Bar Mountain Bike Tips", which has become a very popular target for searches on the subject of drop bars for off road bikes. I have decide it is high time to update this popular post with new information. I am going to re-post the article here, and newer information will appear in blue text. I've seen a lot of questions lately on the subject of drop bars for mountain bikes. I think that there are a lot of misconceptions out there on just what to do and how to do it, so here's a few tips. These concepts were gathered through reading material on the subject by Charlie Cunningham, an early adopter of drops for off roading, and from an excellent piece done on the subject by Don Person, better known as "Shiggy" on mtbr.com's forums. 1. Probably the biggest misconception out there has to do with the height and reach of drop bar set up. Here is something that will help clear it up for you. Always, always, always ride off road in the drops. Off road drop bars were not meant to be ridden "on the hoods" as so many roadies are doing. The reason for this is control. Off road the bumps and jarring will make riding on the hoods a dangerous proposition. Riding in the drops actually lets you relax your grip, since the bumps force the handle bar into your hands. Plus, the round cross section of the bar is far easier to hang on to than the hoods. Note: You can use all portions of an off road, mountain biking drop bar set up. However; your primary position for operating the controls will be from the drops, since this will be where you will be most of the time with your hands while actually riding mountain bike trails. Sure, there will be times you can grasp the tops, cruise in the hoods, or put your hands elsewhere on the bars, but these times will be fewer and father between than they would be on a road bike. For the "Why Would You Use Drop Bars Off Road" question, see my next post on the subject coming soon. 2. Taking #1 into consideration, it becomes clear that your off road drop bars are to be at a height where the drop section would be level with the height where your grips would be on a flat bar set up. This generally requires a high rise stem for your drop bar. You also could get a "drop bar specific" frame such as the Salsa Cycles Fargo, or Singular Cycles Gryphon, amongst other choices in custom built bikes. 6. Drop bars can be used with single speed drivetrains or multi geared. STI shifters work great off road even with flared bars like the Midge, WTB Mountain Road Drop Bar, Woodchipper, Luxy Bar, and Gary Bar. Bar end shifters can also be used, but because of the flared drop ends, they can sometimes be damaged in crashes. 7. Brake lever tips should be easily reached from the drops. This means you will run the levers lower down on the bars than a road set up. Much lower! Mechanical disc brakes can be set up for use with drop bars if you use Avids excellent BB-7 for road levers, and there is a cheaper Tektro road disc brake as well. Currently no hydraulic disc brake set ups are available for off road drop bars. Note: It won't be long before hydraulic "brifters" become a reality. Hydraulic converters for standard levers already exist. For the best feel in a mechanical disc brake set up, always use top quality housings and pay special attention to your caliper set up. Okay, that should help, but if there are any questions, let me know. I'll be glad to answer in the comments section. Salsa Cycles Fargo model has been a game changer ever since it hit the scene back in 2008. The original 29 inch wheeled "Adventure Bike", the Fargo carved out a new niche in big wheels while it confounded many that didn't (and may still not), "get it". Based on a design that would not be capable to fit a suspension fork to, and would be designed to be used with drop bars, the Fargo was unique and caught the imaginations of many. Then a few things happened up at Salsa Cycles HQ which signaled a change for the Fargo. The Vaya was introduced, which was essentially a skinny tired version of the Fargo at the time. Since the Fargo was so close in design and intentions to the Vaya, and the Vaya had the paved/road side covered, Salsa redrew the lines for the Fargo and colored in a more "dirt-centric" hue for a new version- the Fargo Gen II. The new version of the Fargo also got a new color- "Cream Scheme", which is a kind of brown-ish bone color with a pearlescent sheen. I went with the Fun Guy Green of the Fargo 3 complete. That is the same color as the Gen I Fargo. The Gen I Fargo has different graphics, which were a "transitional" style coming off their former pin stripe heavy, Tex-Mex style. The new Fargo features the "wood cut" type graphics which have a love-it-or-hate-it appeal. I'll be honest- When I first saw images of the newer Fargo graphics, I was a bit let down. The Fun Guy green ones were especially not to my liking. However; as is typical with Salsa, (and Surly, All City, or Civia), their images stink on-line and in print. So, I reserved judgement until I could personally see the look up close. So, what else is going on here? Well, for one thing, a major difference is in the geometry. This generation of Fargo will accept a suspension fork, if you want 80mm of travel. I'll admit, there were times on my old Fargo I wanted that suspension fork. I'll likely put one on here at some point. But, for now, this will be a rigid build. Another difference is the International Standard caliper mounts, as opposed to Gen I's post mounts. As I understand it from Salsa, the manufacturing tolerances for post mounts are really tight, and they were getting too many out of tolerance frames from the factory, so a decision to switch to the much more forgiving IS mounts was made. Note also how the drop outs and seat stays meet. There is now a little curve there to clearance calipers better. I like the way it makes a gentle curve and gives the rear section of the new Fargo a different feel from the Gen I frame's straight lines. I'll likely use 160mm rotors. I have found that they work just fine on the Gen I with the Tektro linear pull compatible drop bar levers and good housing topped off with a detailed set up to the BB-7 Mtn calipers. Finally, there are still are rack and fender mounts, so the Fargo still will support your adventures with capabilities for racks, fenders, and carrying a load. 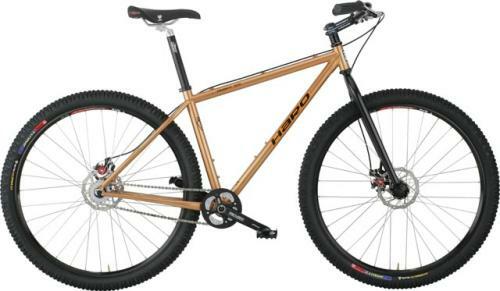 My Fargo build will echo Salsa Cycles "dirt-centric" vision for Gen II and I will be using a mountain triple, a 9 speed drive train, STI levers, a Cane Creek Thudbuster ST, and tubeless tires on disc specific 29"er wheels. I'm going to stay away from the racks and fenders though. Why? 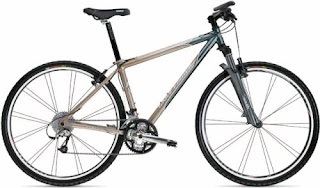 Because Salsa Cycles will be offering a frame bag for the Fargo sometime next spring, and I also will be looking at a big seat pack for this as well. I've been threatening to do a bikepacking adventure for a while now. Maybe I will get on that now! 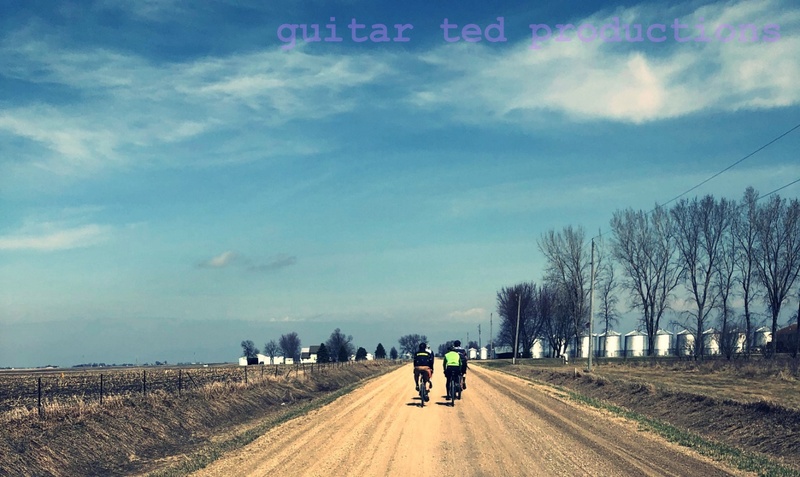 Taking Care Of The "buts": This is the story of a couple of Lincoln, Nebraska fellows and their endeavor called "War Axe Bicycles". I have been aware of War Axe for a while now and they have been methodically making progress towards becoming a ......well, I'll let them say it. "War Axe Bicycles is focused on well-designed, technical excellence. Whether it's our mobile software developed to solve a common cycling need or our frames and forks designed to handle a specific style of riding. We sweat the details, making every effort to merge precise utility with an engaging and exciting aesthetic. In some ways, we are a merger of subcultures, but we know that merger is a lifestyle many of you share. You ride, you're mobile and you're connected." The above was shamelessly cut and pasted from their site. Well, the guys came up with this new rig called the "Parabellum", (Latin for "war". Those guys are clever!) It is a full custom rig, and looks to be a great "adventure/mtb/drop bar" sort of an affair. If you've ever thought you'd like a drop bar 29"er, "but"....War Axe can take care of that, since it is a full custom rig. Check it! War Axe is also doing a nice hard tail 29"er, and may have some other things up their sleeve soon to be unleashed upon the world. They also do some pretty cool clothing and other stuff. Lincoln cycling, yo! No more mech disc brakes? Disc Road Revolution: I have been hearing more solid rumors that the disc brake road/CX bike is going to become a reality in the 2013 model year. NOTE: It will be hailed as the "next great thing", and you will hear all about it ad infinitum from the cycling industry. Whatever! I don't really care about all of that, but what will be cool is that this stuff should be transferable to drop bars for mountain bikes. I also suspect there will be mechanical disc brake calipers that will make the current BB-7 Avid units look like antiques. (I happen to know SRAM has a caliper all drawn up and ready to go, if it hasn't already been given a green light.) This is what excites me the most. It'll be pretty cool, if you can get by the marketing hype and howls from the roadie purists. Too Far-Gone: Gotta keep the drop bar theme going here. The Fargo V1 is not going to be replaced by the Fargo V2 that should be coming, but I am re-vamping it. The Origin 8 Gary II Bars are coming off, and I am reverting back to On One Midge Bars with the bar end shifters. I also am switching stems to a zero rise model. Wheels have been swapped out, and I will be sporting Geax AKA tires, tubeless of course, and this should be a great, go anywhere, do anything set up. I will also be swapping out crank sets soon too, but I still have not decided on what I am going with just yet. Probably a double, but something more modern than the marginal 80's era cranks I am using now. Stay tuned, I should have the V1 Fargo revamped soon, and I'll get some photographic evidence out to show it. Have a great weekend folks. Ride bikes, take pictures, go Trick or Treating! I got an email from a mechanic friend of mine the other day asking me to discuss hubs. You know....those things in the middle of your bicycle wheels that the spokes attach to? Yeah.....those are hubs. And, believe it or not, hubs are not at all created equal. This starts to bring in opinions on what works best, and what doesn't. However; there is one small detail that all hubs need to perform well, and if neglected, you really don't have a leg to stand on comparing your hub to another hub, especially if you are having issues. What would that be? Service. Maintenance. You know.......overhauling your hubs. It has to be said- your hubs and your entire bicycle, for that matter, need to be checked and maintained on a regular basis. Really. I don't know where folks get the idea that you don't have to do anything to a bike to keep it rolling. You do have to work at it. These things need attention, and if you don't give them attention, they will bolt on you like an un-loved woman. So, with that out of the way, and assuming you are taking great care of your particular hubs, what is it that works best? Well, best for what? In the case of my friend, his question was in reference to gravel grinding. Gravel is an insidious enemy of bicycle parts. Just harmless dust, eh? Well, that stuff gets into hubs, and then acts like a grinding agent. It will pit and destroy hub bearings fast. How you keep it out is with seals. There are bearings, and there are bearings. 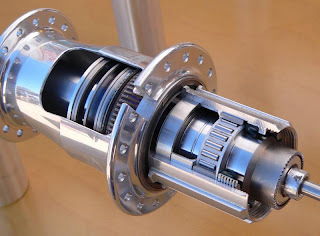 Some are sealed with plastic barriers in a stainless steel case, much like what you see in the Chris King hub, and some are ball bearings that rely on a "labyrinth seal" system, which is what Shimano mtb hubs have used, amongst others. Which is better is a matter of opinion, but generally speaking, the type in the Chris King hub, or "sealed bearings", as they are known as, get the lions share of nods amongst aficionados of mechanicing. The thing is, if a bunch of grit does make its way into the "sealed bearing", it is going to stay there until it chews everything up eventually. The labyrinth seal lets things in and out, so maybe you will get long life, maybe not. Again, servicing a labyrinth sealed system is pretty easy, but you actually have to do it. The sealed bearing system could be serviced too, but it isn't as easily done. My grandfather was a farmer a long time ago. When I was a young lad, I would follow him everywhere he went, watching his every move. He was my hero at the time. Well, as he would go to hitch up an implement to the ole John Deere A Model, he would grab a grease gun from the engine bay, and grease the implement before he used it by squirting a few pumps of grease into a zert on different points on the implement. This forced old, watered down, dirty grease out, and replaced it with new, fresh grease. Maintenance. You know what? There were bicycle hubs that you could do the same thing with. Brilliant idea, and too bad it doesn't exist as new anymore. It was developed by Charlie Cunningham of WTB, and it was called "Grease Guard". Suntour licensed the technology for a while as well. 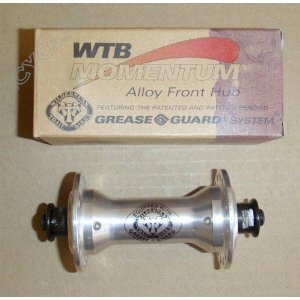 I had a full XC Pro Suntour Grease Guard gruppo on my first serious mtb, and like my grandfather, I greased those bearings regularly. Never had any problems keeping those bearings smooth and trouble free. In fact, the wheels still live on my Xtracycled Schwinn, and the hubs have never been apart. Don't need to be. As long as I can grease them. Seems to me it is an idea worth reviving, especially for us dirt and gravel riders. Cell phones are the devil, but where cycling is concerned, they can be useful tools, or heck, even a life saver. I can totally see where a cell phone is a good back up for a cyclist, and why loved ones want us cyclists to carry one. I even understand that cell phones can become cycling computers. Tools to navigate by even. Yeah...aps and all that. But cell phones weren't made for cycling. In fact, they aren't made for much of anything practical. Those tiny buttons, the user interfaces, and they don't always work as advertised. Cycling, (at least the kind that I do), is really hard on cell phones. Dust, dirt, bouncing around, and just the rough and tumble of daily commuting is not what most cell phones, "dumb" or "smart", were designed for. What were they designed for? Silk purses? You'd think so by the prices on some of them! What Would You Do? So I have been thinking. 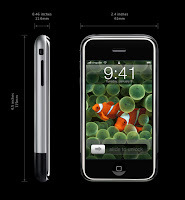 Yeah......the iPhone is cool, but it is fragile, and you have to get a case, and a holder, and ........No! It is wrong if you have to "band aid" the thing to work for cycling. It isn't a cycling cell phone. It just isn't. 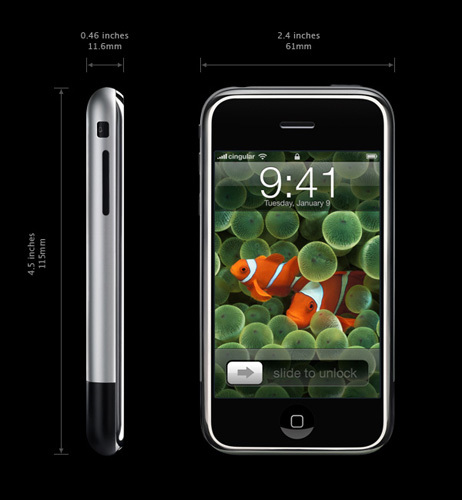 Other cell phones don't measure up either. So.....what is a cyclists cell phone? Solutions: I am dreaming, and this will probably go nowhere fast, but I wanted to explore what it might be that would make a good cell phone for active cyclists that could go mountain biking, bike-packing, touring, or just do the daily commute grind without being babied and put in a zip-loc bag. Buttons: My ideal cell phone would have one single button on the outer case (weather-proof, of course), that you would push to answer a call. Hold it down a few seconds to power up-off. Every other button would be inside the flip case. This eliminates potential damage, noises from supposed "locked keypads", and eliminates false calls, or other unwanted digital mayhem. Inner Keypad: This would be revealed by flipping open the case and would be made up of buttons you could operate without removing your cycling gloves. (Full fingered cycling gloves people!) I am not sold on having to have a "qwerty" keypad, but if it could be done, and I can operate it with my full fingered gloves, so be it. A very small display for alphanumeric symbols only would be the only visual display. That's it. No camera. Why? I carry one that blows any cell phone camera away. I don't want my phone to be a camera. No music. Why? I don't listen to music when I ride, but if I did, I would use an iPod or like device. No cyclo-computer/nav system. Why? Because I can get a Garmin 800. BAM! I don't want a "smart phone" that is a jack of all trades- master of none. I don't want a smart phone that eats up my battery trying to run radios to hook up to cell towers, GPS satellites, and WiFi. I don't want some namby-pamby glass covered exercise in modern art that falls apart on a granite rock. I want a freakin' rock solid, reliable phone that does phone and texting really well and has a battery that lasts two weeks on a charge. This vehicle will get me there. Too early? It's never too early to start planning for "next year", (in this case), and I've been doing some mental exercises and making some decisions. Obviously, the Snow Dog is running perfectly, and with some minor tweaking, this rig is going to see a lot of use this winter. I am most excited to use this bike for several reasons. So, that will be a big chunk of my winter plan. It doesn't make any difference if it snows a little, or a lot, or not much at all. The Snow Dog won't be stopped! Yes folks, my Gun Kote purple El Mariachi is going to be "retired" and parts transferred over to a green El Mariachi frame when ever I can get my hands on a green example of this 2012 El Mariachi. The purple ano bits on that old El Mar are going somewhere else......stay tuned! The green El Mar will be dressed out in the White Industries crank, black Industry 9 wheels with Duster rims, a new bottom bracket and head set, (yet to be determined), a new seat post, a Bend 2 bar, Salsa stem, and Ergon grips with a WTB SST saddle. Brakes will be something new too. That's right folks, I didn't mention "shifty bits" because this one will be a single speed. I also didn't mention a fork. I am still contemplating that, but I do have two things here that would work really well. I am just waiting to decide if maybe I should try a new carbon for with a strong resemblance to a Niner carbon fork. We'll see. Wheels will be swapped, wheels will be built, and I also plan on pursuing that gravel bike build as well. Oh yeah........there is that old road bike I just got a hold of as well! All this and more Trans Iowa madness, gravel road riding, and who knows what. Planning. It is fun to do. Hopefully it all works out. This is the second post in the series "Post Nano 29"er History" which aims to give the reader the sense of how 29'ers have become as popular as they are today. If you missed the first installment, please click here. If you are looking for more on 29"er history before 1999, please see my page on 29"er history here. A Pivotal Year: Previous to 2005, it wasn't a "done deal" that 29"ers were going to become anything other than a side show curiosity. However; several events took place in 2005 that went on to solidify the wheel size in the marketplace, and definitely hastened the wheel's acceptance in the industry and outside of it by the riders. While some companies kept watch on the 29"er movement, others were going to take the plunge no matter. QBP had Surly and the Karate Monkey going over quite well, so the 29"er idea became a project over on the Salsa Cycles side also. All throughout 2004 Salsa engineers worked on making a radical new "soft tail" frame taking cues from some titanium builders. 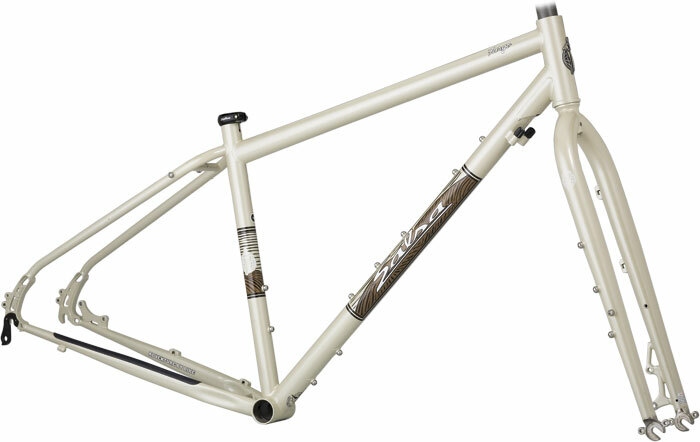 The "Dos Niner" came out from under wraps at the 2004 Interbike show and instantly became Salsa Cycles best selling frame in 2005. 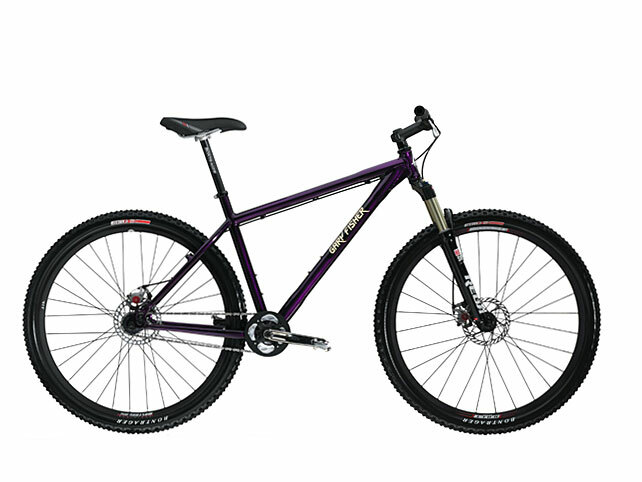 2005 also saw the re-introduction of complete hard tail bikes for Gary Fisher, but the real show stopper was his purple single speed called "The Rig". The bike originally retailed for under a grand, and later prices went up to $1100.00, but it didn't matter. If you didn't get in on the pre-order, or down to the shop before spring, you missed the boat. Fisher was on the upswing, and had the Rock Shox Reba 29 exclusive for a year, and it was flying out the doors of shops. Salsa kept refining the frame, and added more hard tails to the line up with the El Mariachi and Mamasita coming a couple of years later. Tires: Of course, tires are one of the necessities for 29"ers to exist, and still by 2004, there were very few choices. Something strange happened in 2004 though that may have had big implications in the 29"er world later, and it all had to do with tires, or to be more specific, "a tire". Specialized Bikes, who said they would "never make a 29"er", in so many words, had an elite XC racer that was tabbed as a possible winner of the 2004 Olympic MTB race in Athens, Greece. Apparently, the course was a former grass track with some gravel sections, and was mostly dusty dirt. The athlete in question was thinking a 29"er hard tail was going to rule the roost, and Specialized may have been helping by getting some tires made to put on a 29"er for this racer. Unfortunately, the racer was tabbed for a doping offense shortly before the Olympics, so the project was mothballed. In fact, Specialized raffled off 20 sets of 29 inch sized Fast Trak" tires for the first 20 guys on mtbr.com that responded. This set off a lot of speculation, but it is safe to say that Specialized was already tinkering with 29"ers by this time. 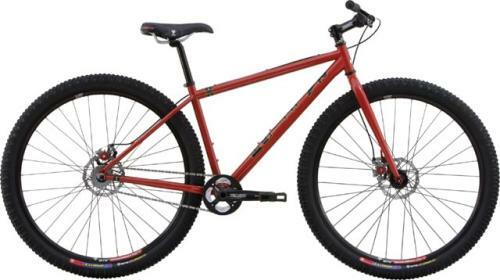 By 2006, the Fast Trak was a defacto product in Specialized's catalog, but still, no bicycle. That wouldn't happen until 2008, but obviously, the behind the scenes preparations for the 2004 Olympics and the Fast Trak raffle of 2005 were important marks in the march towards full acceptance of 29"ers. More tires were also hitting the shelves from WTB, (ExiWolf), Kenda, (Karma), and a few others. 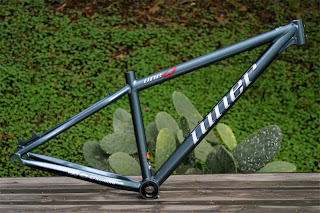 Effects: The sales of 29"ers were starting to grab the attention of bigger companies, (Specialized is a great example), but more importantly, the wheel size was getting a lot of grassroots support, which manifested itself in sales of custom rigs to fit 29 inch wheels and spawned more than a few new custom builders in the process. This in turn was affecting product engineers and marketing managers who were watching this intently. 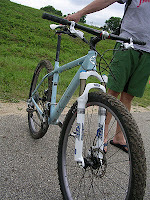 In fact, several mid-level companies were busy making plans already in 2005 to get on board with 29 inch wheeled bikes. In the next two years, the market for a prospective buyer of a 29 inch wheeled bike suddenly became a much bigger collection of choices with much easier to find outlets. This began a snow ball effect of even more companies offering 29"ers, and by 2007, it was starting to get harder to name everyone that was making production 29"ers. I have made some big inroads on recon for T.I.V8. One third done with physical recon, 75% sure on the rest, with only a short bit to do in country I've never been in before. It's coming together very nicely! It was an intensely sunny day, and where I was, it got so warm I ended up using the A/C in the "Truck With No Name" . Dust was kicking up to the heavens from my passage. First of all, I apologize for the cheesy images. I was driving my rig at about 45mph, swanning all over the road, and trying to get photos while I read maps, mentally did calculations, and watched out for farm implements and dogs. So, yeah.......sorry about the reflections and ghost images! That said, feel free to click on an image to enlarge it and see if you can guess where in Iowa I was. Goals: With this edition of Trans Iowa, I wanted to cover a lot of ground I hadn't been over before. I wanted to try something a little more daring, (from a course choice standpoint, not really affecting you riders), and because of these things, I had some major questions to answer during recon. It was going to be a kind of "winner takes all" deal, or I was going to come back home with my tail between my legs and have to start from scratch. Look at the dust from the truck! I had a course to Checkpoint #1 figured out a long time ago. It's about 55 miles in. Since that is country I've been in quite a bit, I don't have much worry about it. I'll recon that later, but what came after would be critical to making my loop for T.I.V8 work. I started in the Checkpoint town, and what came immediately after, well......frankly it is pretty boring! Typical grid, flat, straight Iowa roads for several miles. Really. (I know lots of you Vets are thinking I'm playing you, but you'll see!) I was thinking this was going to be a long, uninspiring day, but things got a bit more interesting the further I went into the "big-assed loop"
I am purposely cutting back the number of B Maintenance roads this time, because, well......ya know, it's supposed to be a "bad year" this time around, right? This may get the axe! The first B Maintenance road is a cake walk. Flat, high elevation, ditches, and a mile long. Won't be too bad unless it rains during the event. The next one; however, is a different story altogether. So, I wended my way down, around, and through some territory I hadn't been through before. This was very enjoyable for me. It is what makes doing all this work fun. There were two critical bridges that needed to be there and in great shape to make this section of the loop work. Fortunately, both were in excellent shape, and only if we have catastrophic flooding will these be in any danger of not being in use at the time of T.I.V8. This sector went by pretty fast, but was more rolling, very scenic, and dead straight. You'll go miles before needing to make a turn, so don't fall asleep at the wheel and miss one! It's funny how that can happen- You're thinking you don't have to worry about looking for a turn for awhile, and the next thing ya know.....whoops! Then it happened! The dreaded "Road Closed" sign reared its ugly little head. Drat! But......this is why you have to physically lay eyes on every mile of the course. I/we have not always done that in the past, and almost every time, it'll bite ya come Trans Iowa time. I'm not taking any short cuts this time around folks. I am personally going to inspect every foot of my T.I.V8 course this time around. Well, this was shown on the maps as "being open", but it obviously is going to be taken out, and I'm betting this bridge won't be replaced. So, I sat there with the map and plotted out a work-around. It didn't take too long, and with the help of some soaring hawks, I found the way around the closed road. It actually was a better way to go too. So, two questions answered, one problem solved, and the next question was fast approaching. I was in a county township I'd never been in before, going to a town I'd never been in before. I had to ascertain the best way to get into this town using the least amount of pavement and keeping away from some heavily traveled highways. With a bit of map perusing on a sunlit rural hill, I found the correct solution! Onward, I also discovered a nice convenience store which was just off-route. This would work great with the one I discovered earlier back up the road, that was a total surprise to me. Getting re-supplied should be no problem in the first half of T.I.V8. Getting out of this city, I was headed to the "do-or-die" section of the course. If the bridge isn't there, the course would have to be scrapped. This was a lynch pin to the whole loop. I had been looking at aerial photographs of the area on Google, but you never know. I saw the bridge, but..... Like I said, ya gotta drive the entire course. If that bridge wasn't there, I'd have to go miles out of the way, and have to re-configure the linkage points, and well....fortunately it didn't have to go that way. I'll tell ya, I was pretty stoked to see this bridge when I saw it. With that out of the way, I entered more strange, new, and scenic land that I was really having a good time checking out. The "grid" was abolished here. Yup. Hang on tight to that wheel and keep the truck on the road! Curves, and lots of em, were snaking up, down, and around the beautiful land. By now it was well past noon, and I didn't know how much more recon I was going to be able to squeeze in. I don't plan this, really, but somehow I always seem to drive by lots of cemeteries. They find me, I don't look for them! I get a lot of ribbing from certain T.I. vets about this phenomenon, and to be honest, finishing T.I.V3 and starting T.I.V5 at cemeteries probably didn't help my cause any. Honestly though, Iowa must have a cemetery about every ten miles in any given direction. Heck, I found one on the first B Road! Weird. So, in the end I had to cut things short and head back home. I promised Mrs. Guitar Ted I'd show up in time for the evening meal, and I had a loooong drive ahead of me to get back to town. I am pretty stoked. Every sticky point was no big deal, and I only found the sketchy B Road and the road closed sign that gave me any pause. The course so far is pretty solid. The roads are, for the most part, not ones to be closed down, truncated, or have any sketchy bridges that may get closed before T.I.V8. This new post is the beginning of a series that is going to cover the earlier days of the 29"er as we know it now- What I like to call the era of the "Modern day 29"er". If you want to read the history of the big wheels, here is a good place to start. The Internet Influence: The rise in the popularity of 29"ers is directly tied to the rise in the use of the Internet and specifically, forums, of which Mountain Bike Review.com is the foremost influencer from this time in 29"ers development. There were a couple of other fledgling sites; Bob Poor, who influenced the production of the first Nanoraptors, had a site, Jan "Cloxxki" Klok from the Netherlands also ran a site for a time. In 2005, a couple of fledgling 29"er sites started, twentyniner.net and Twenty Nine Inches.com. These sites and individual's blogs brought a lot of information that otherwise would have been cut and buried by magazine editors to the masses. The masses obviously responded. Near Death: 29"ers may not have made it much past 2004 had it not been for something significant which happened in late 2003. During this period, the only major manufacturer supporting the fledgling wheel size was Trek/Gary Fisher Bikes. Sales of 29"ers were poor. So poor that parent company Trek was going to pull the rug out from under the program. At this early juncture, this action would undoubtedly have sent a very negative signal throughout the industry. The "nay sayers" would have had their day, and who knows what, if anything, would have become of 29"ers. As it was, internal pressure to give the wheel size another chance resulted in an unlikely "savior". This turned out to be a "hybrid' of a 29"er frame and 700c hybrid bike spec Gary Fisher called "Dual Sport"
29"ers were hard for the dealer network at Fisher to understand. Many dealers weren't even bringing them in, and most didn't stock accessories like tires and tubes for them. However; the Dual Sport concept was embraced by the dealerships and sales increased to the point that 29 inch wheeled hard tails were re-introduced into the line for 2005. (They had been missing entirely from the 2004 line, with only two full suspension bikes offered with big wheels that year.) Not only that, but another development behind the scenes turned out to be the spark that the entire 29"er movement benefited from. Gary Fisher paid for the development of a new suspension fork by Rock Shox for 29 inch wheels. It was introduced for the 2005 model year, and its name was "Reba". Previous to the 2005 Reba, only sub-performing forks from White Brothers and Marzocchi were available. Now 29"er riders had a fork on par with decent 26"er forks for the first time, and of course, other companies took immediate notice of this and the increasing interest in 29"ers. All In: Late in 2004, a strange banner appeared on the 29"er forum of mtbr.com. It proclaimed "Niner Bikes: The Big Revolution"
It was a company, (or was it? ), that had a banner on a site where formerly there had been the banner for WaltWorks Bikes, a small, Colorado based custom builder who was really behind 29"ers. Forum members were curious, and some actually were offended. Who were these upstarts? Well, they were a couple of bike industry guys that fell in love with big wheels and started their own company in 2004. Their first product was a Scandium aluminum single speed frame with a Reynolds steel fork called the "One 9", which debuted in mid-2005. They proclaimed to be a company only doing 29 inch wheeled product. By the following year, they even had prototyped a six inch rear travel full suspension bike as a "proof of concept" piece, which sparked a lot of conversations in the industry. Niner went on to introduce a steel frame, the "SIR 9", then geared hard tails, and full suspension rigs were soon to follow. 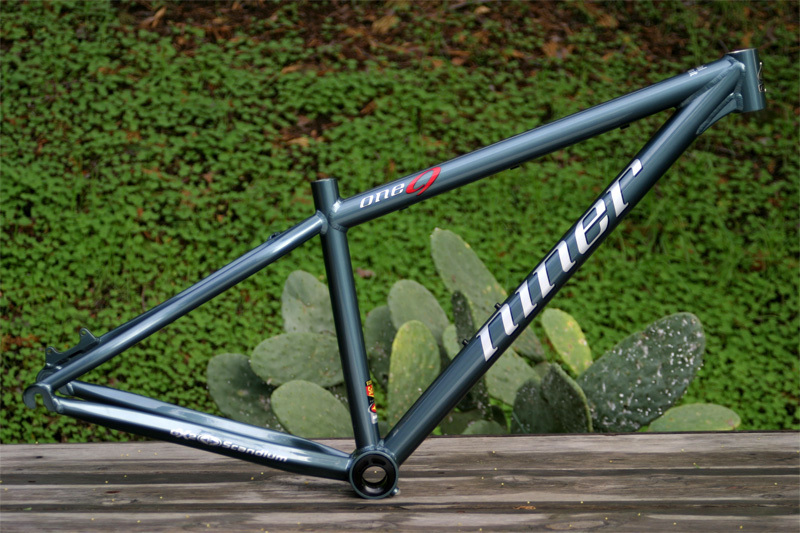 Along the way, Niner Bikes influenced component makers and industry thought about 29"ers in a very positive way. The company has stayed true to its "29"er only" roots all the way to this very day. Yesterday I wrote about my friend's idea about the "EveryBike". (See that post here) Well, today you can go to Grannygear's blog and get his take on it. So, anyway, here's another look at that new Lenz Mammoth rig with the 5" travel front and rear set up. I hear it comes in at 27lbs with a dropper post. Not too shabby, I'd say, for a reasonable build. Is it too much? Maybe for me, around here, it would be. However, you could easily have a lot of fun on it here, and go just about anywhere with that bike, not change a thing, and have a capable XC/Trail bike. One bike to rule them all? Almost..... I don't think any bike nerd could ever have just one bike. Riding Buddy: My son didn't have school today, so when I got home from work, my riding buddy and I went out for a sidewalk cruise. He is a first year rider, and he's getting the hang of things pretty well, considering he can't just go ride his bike anywhere like I could when I was a kid. At any rate, I get a kick out of his viewpoint. Like today, he says, "Hey Dad! Are we going uphill here?" (See image) Well, I didn't think we were going "up", but when I paid attention, he was right. It was an incline. He's super sensitive to that. I don't know if that is good or bad, but I find it interesting that he can tell so easily. Heck......I had to actually think about it to know! The other thing he does is that he chatters, or at least makes noises, the entire time he's on his bike. Never stops! I guess it's pretty exciting for him. That's good. The final thing I noticed on this particular ride was that he was stoked to ride in a church parking lot. I hadn't realized we hadn't done that yet. The big, wide open space was a sort of freeing feeling for him, I think. No boundaries! We do go down alleys and poke around where cars can't go whenever the situation offers itself up. I think part of riding fun is exploration. I hope my son gets that part about cycling. Anyway, you all should ride with a youngin'. It is definitely a mind opening experience. Trans Iowa Recon: Heading out super early on Saturday morning to start Trans Iowa recon. Should be a day of Red Bull, processed beef products, water, gravel, dust, scribbling down notes, takin' pics, and thinking. I've got a few "trouble spots" the maps are indicating that will definitely be getting checked out. I may leave the "no-brainer" bits for another weekend, just to give myself some relief. I had thought about a full-on assault to get it done in one shot, but I'm going to roll the dice and hope I get one more decent weekend of weather in here before the snow flys. My friend in California, Grannygear, has a concept he has called "The EveryBike", which is basically his take on 29 inch wheeled bikes coming out now that are blurring the lines between XC/Trail, and in some cases, even a touch of All Mountain goodness thrown in there. Of course, these bikes have existed in 26"er size for several years now. Usually 5" travel full suspension rigs like the Santa Cruz Nomad, or the Ibis Mojo. These bikes are often in the 5-6" travel range and are lightweight for the long travel and toughness they bring. Light enough for XC duty with your friends, and burly enough to do a serious outback ride with serious drops and long climbs. Truth be known, these were the class of bikes that caused their riders to laugh at the big wheels, because they never thought they'd see a day when the versatility and fun factor would be challenged by anything with 29 inch wheels. That is changing fast though. Is that day here yet? Are big wheelers giving these bikes a run for their money? I think if we're honest, that day isn't quite here yet, but it sure is dawning. Bikes are coming for the model year 2012 that will begin to chip away at the hold 26 inch wheeled bikes have had on this category for years now. 29"er bikes are getting there, but many have a ways to go yet. Take for instance this Diamondback Sortie Black 29 I rode for Twenty Nine Inches recently. This one has 120mm travel front and rear, so it's in the ball park travel-wise, but it is heavy. (27lbs plus as seen here) That weight will have to come down some to get it competitive with the 26"ers. I think it could definitely get there in carbon fiber. For an alloy frame, it's probably close, but not quite there. The other thing that "isn't quite right" is the geometry. I think the Sortie's 70 degree head angle is likely a hair on the steep side, but it is okay. The real kicker is the 18 inch long chain stays. 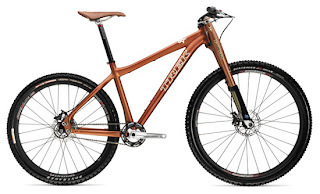 While I thought the Diamondback was a lot of fun, I bet it would be even more so with 17.75 inch chain stays. Close, but not quite there.......yet! But there are some bikes coming very soon that may make a bid for the "EveryBike" with 29 inch wheels. These bikes will have slightly slacker head angles, longer travel suspension, and lighter weights overall. Some will be carbon fiber, of course, but even aluminum bikes will begin to appear that will stake out a claim as a "stable killer". The bikes won't be all-out AM/Trail bikes like the Banshee Prime and their ilk. No, these will be capable, (perhaps), of some light AM duties, but these will primarily become the bikes that the 26"ers before them were: XC capable, with weight in the ball park of an XC bike, but having "longer legs" than an XC bike would, being capable of doing most trails really well. 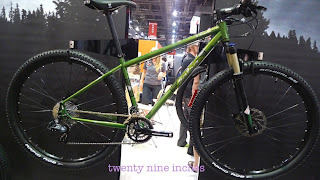 My "poster child" for this genre of 29"er is the new Lenz Sport Mammoth. A five inch travel, decently light weight full suspension bike that has short-ish chain stays, big tire clearance, and geometry that will take it from the XC trails to back country epics with ease. Of course, it isn't the only bike coming that will push this concept even further. 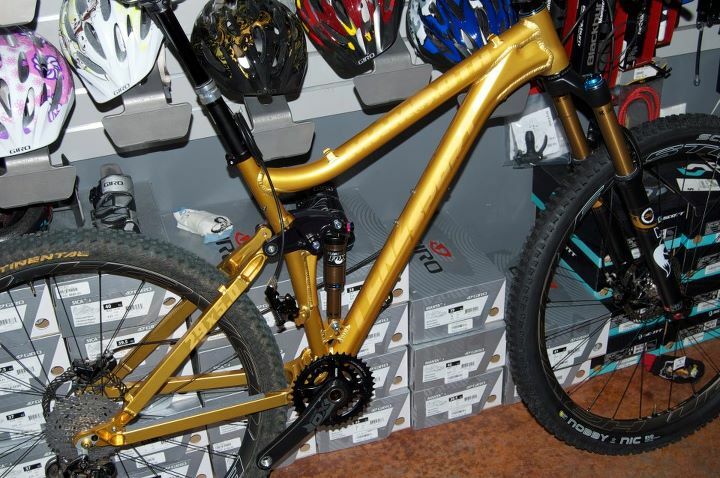 You can add bikes like Salsa Cycles Horsethief to this mix, perhaps, and for sure, Specialized's Camber comes to mind. Ibis will even add their own bike to this genre in the Ripley, which will be coming out.......sometime! Is an "EveryBike" right for you? I'm thinking it will be for a lot of folks. Note: All rights to the name "EveryBike" are attributed to Grannygear and any references to "EveryBike" here or elsewhere must give credit to the source, or bad bike karma will find you! Anyway, here is the deal: My friend, Ben Witt, has a size large Fun Guy Green Gen II Fargo frame he needs gone, so I am grabbing it from him, (at a price, of course), and then......well, I haven't yet decided! There is a really good chance that the newer Fargo will be replacing an older custom bike I have sitting in the Lab which hasn't been ridden since the snow flew last. That frame and fork will just go up on the wall, and Fargo Gen II will get the nod as the single track drop bar bike with options. The parts from the older custom rig will go right over to the newer Fargo. Maybe I'll track down a 80mm suspension fork, or do some fancy travel reducing to an older fork I have for this. We'll see....This does a couple things for me. As I said before, I really feel at home on this older Fargo. Yes- it is heavy, and it doesn't have the capability to do suspension forks, and it might steer weirdly at times, but this bike.....it fits me too well! I am going to get a proper 9 or 10 speed crankset for it, and at some point, I am going to build up a decently light weight set of tubeless wheels, (or press into service some older light weight wheels I already own), and I am going to dedicate the Fargo Gen I to be a fat tired gravel bike with options. I'll likely get a Tangle Bag for it, and possibly one of those ginormous Revelate seat bags, and use it for my long gravel tours. The Fargo Gen II will be "dirt-centric" and used mostly for anything with a lot of rougher going, regular mtb rides, and of course, the bags could be transferred over from Gen I Fargo for anything remotely looking like bike-packing. Fringe: My wife, Mrs. Guitar Ted, likes this weird new T.V. series called "Fringe". It's a Sci-Fi deal where weird things are happening all the time, and the show's Chief Of Weirdness, a character named "Walter", is always rambling about some bizarre thing or concept, (that is if he isn't trying to give himself a self-inflicted lobotomy). So, just what is, (or you could almost say "was"), a "69er"?Well, I wrote about Trek's ill-fated attempt at the concept here back in the summer of 2006. Basically, it was a 26"er out back, and a 29"er up front, and everything together was supposedly the "best of both worlds". (Keep that phrasing in mind for the 650B coming up...) How's that? Well, the proponents of the concept said that you got the "roll-over of the 29"er and the acceleration of the 26"er". Actually, you got the worst of both worlds along with it, but nobody wanted to talk about that! The thing is, this concept didn't really work for a lot of riders. Especially once you figured out how a 29"er rear wheel was actually more important to have from the standpoint of traction and propulsion. Also, that smaller rear wheel just acted like what it was- a 26 inch rear wheel, and having a 29"er wheel up front really didn't change things much from the standpoint of a front suspension bike. The 69er guys didn't like the heavier weight of the big 29" rear wheel, but guess what? They don't have to weigh that much, and lightweight 29"er wheels are easily had these days. In the end, the marketplace just didn't really fire up for this idea. It's pretty much dead in the water. To be fair, Carver Bikes still offers this concept, although you don't really hear too much about it anymore. Fringe indeed. 650B? Yes....the "tweener sized" wheels of mountain biking. Not as big as 29"ers, they are somewhat lighter, (potentially), and roll over stuff marginally better than the ever so slightly smaller 26"er sized wheels. Once again, the claims of "it is the best of both worlds" were heard but as before, there were not many real world benefits that I could sus out to back that up. 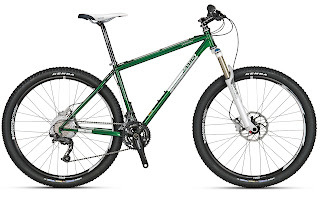 I rode 650B bikes every chance I got from 2007 till 2010, and every time I just couldn't see where they were going to out do a 29"er at what it does best, or be anything but marginally better than a 26"er hard tail or full suspension bike. That isn't to say I didn't ride some nice 650B bikes. I did. Some of them I liked just fine, but not more so than a good 29"er. They just weren't far enough removed in feel from 26"ers, and they just didn't quite get to the level of a 29"er. "Pundits proclaimed that 650B would be where 29"ers were in 2007 by 2010. Then the economy went south, and so seemingly did any hopes for the 650B wheel to take root." To be fair, the economy certainly took risky ventures like adding 650B bikes out of the picture for some companies, but in my mind, that isn't the only reason this fringe element of mountain biking hasn't gotten as far as the 650B fans had hoped. Essentially, the very nature of the wheels being "in the middle" of two other very popular wheel sizes has marginalized the appeal of 650B mtb designs. I know I feel this way about them, and I think lots of other riders do as well. Of course, that isn't to say that 650B is going away. It isn't. Jamis and KHS have really staked out a nice slice of their line ups for 2012 in the tweener wheels. However; it isn't looking to catch on in a big way. Fans of the wheels are saying that it will take one of the bigger companies to legitimize 650B to the masses. I'd disagree with that. It's going to be rider driven if anything, and I don't see that like I did with 29"ers happening for 650B. It's staying on the fringes as far as I can tell. Ride A Bicycle? You Loser! Did I Mention I Was Converted?